That's right. 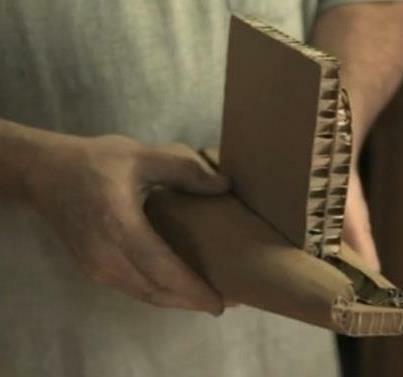 A bicycle made of cardboard that will support the weight of it's 250 lb. inventor. Izhar Gafni is a man who loves bicycles. When he heard about a man who made a canoe out of cardboard he thought, why not do the same with a bike? Folding the cardboard like origami and applying a coating that makes it both water and fireproof, the bikes will sell for $20-30 each! The idea is that they will be an affordable option for people in countries who rely primarily on their feet for getting around. This is the seat (upside down)! This 6 minute video from Giora Kariv introduces us to Izhar and gives an inside look into how it's made. 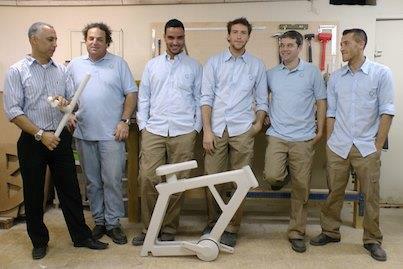 Through his company, Cardboard Technologies, the bicycles should be available in the next year and then Izhar intends to start making wheelchairs out of cardboard. You can read a more in-depth article here and/or like them on Facebook to get updates on their activities. I can't wait until Critical Mass has more cardboard bikes than fixies!